Construction of artificial light-harvesting systems - via coordination driven self-assembly - capable of mimicking natural photosynthesis. Stability, dynamics and photoreactivity of certain guests in nanocavities. Photophysical and photochemical studies in organized supramolecular nanoarchitectures especially designed for lighting applications such as accumulation and tuning in fluorescence, up-conversion of light, electronic energy transfer (EET) to a reactive center, EET based sensing systems, etc). Excited-state kinetics and thermodynamics of rotational phenomena in suitably tailored organic photosystems which could form the basis for molecular machinery. Color Tunability in Organic Light Emitting Diodes and Optical Lithography. The new activities of ES Lab focus on the design and supramolecular synthesis – via various self-assembly protocols - of cleverly engineered self-assembled molecular networks capable of harvesting light for tuning and tailoring the properties of advanced materials. 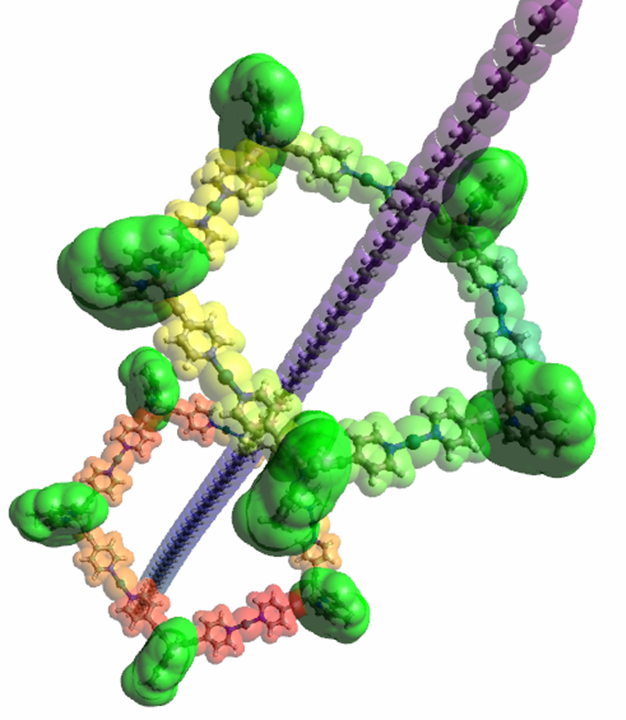 More specifically, we are interested in constructing stiff and compact metallosupramolecular architectures with well-defined shape and size, in which the chromophoric subunits to be predefined, suitably-separated and precisely aligned through space. We are intending further to explore systematically the critical issue of how precise control over size, shape, spatial resolution, and periodicity of concentrated matter can unmask favorable - free of excitons traps - pathways for beneficial transfer of photons into a (re)active center. Partial illustration of a rigid 2D self-assembled molecular network between properly designed light active subunits (sensitizers – emitters).